Also known as the Tar Heel State, the principle products during the early history of North Carolina were tar, pitch, and turpentine. The state capital of North Carolina is Raleigh. North Carolina Travel and Tourist Information with links to official travel and tourism websites and state resources for visitors to North Carolina. Around North Carolina, Beaufort, Charlotte, Durham, North Carolina Municipalities, North Carolina Tours, North Carolina Travel Guides, Outer Banks, Raleigh, Wilmington, Winston-Salem. Find out more about North Carolina before you travel there. The settlement was laid out in 1792 and named after Sir Walter Raleigh. Along with Durham and Chapel Hill, Raleigh is part of the state's Research Triangle. The universities are major attractions in the triangle, and of course the State Capitol is in Raleigh. The first state capitol was destroyed by fire in 1831 and the Greek Revival structure became its replacement in 1840. The North Carolina Museum of Art, at 2110 Blue Ridge Blvd., has eight galleries displaying early Egyptian artefacts and paintings by Raphael, Botticelli, Rubens, Monet, Wyeth, and O'Keeffe. North Carolina is named after Charles I and Charles II of England, and can be split into three distinct areas. States neighbouring North Carolina are: South Carolina, Georgia, Tennessee and Virginia. Sir Walter Raleigh's first colony in the US mysteriously disappeared from North Carolina's Roanoke Island. Situated in the west of North Carolina, Asheville is an excellent gateway to the misty Blue Mountains. George Vanderbilt's 250 room French Renaissance-style castle has to be seen to be believed. Built in the 1890s, it is the largest private home in America. Visitor information for Brevard, North Carolina; where some of the the state's most beautiful waterfalls, streams, and mountain trails await you. Cape Hatteras National Seashore features Cape Hatteras Lighthouse (built in 1870) and other points of historical interest. Learn how the Indians and pioneers survived by hiking for edibles at the National Parks' field school. The public office of North Carolina state. Where to go and where to stay: mountains, heartland, or coast? Duke University is a major attraction in Durham, and you can also visit the homestead the Duke tobacco family. Beaufort is the third oldest town in North Carolina and has a rich historical heritage. Guests will enjoy visiting many local county sites including The North Carolina Maritime Museum, the North Carolina Aquarium, Cape Lookout National Seashore, the Rachel Carson Estuarine Research Reserve and Fort Macon. The largest city in North Carolina is also the third largest banking centre in the United States. The Mint Museum of Art, famous for its extensive pottery and porcelain collection, is housed in a former branch of the United States Mint; in operation from 1837 to 1861, and from 1867 to 1913. A hands on science and technology museum in Charlotte. The North Carolina coastline has a notorious history; more than 600 ships have sunk off the hazardous shores, including Blackbeard's flagship. From remote wildlife refuges, sheltered inlets, and endless beaches to upscale resort communities, these strips of shifting sand offer both peaceful retreat and awesome adventure. Use this guide to discover the Outer Banks' rich seafaring history and its newest tourist attractions as well as limitless opportunities for fun, dining, shopping, and recreation. The two towns of Winston and Salem merged in 1913. Historic Bethabara is a restoration of the city's first Moravian settlement in 1753. Battleship North Carolina is a must visit when you visit the Southern Coast of North Carolina! Its in Wilmington, docked right on the Cape Fear River. Sent in by: Insider's Guide to Wilmington. North America Index - North America Tourism - North America Websites. 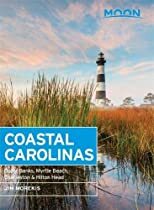 North Carolina Guides - North Carolina Maps.